WebHostingWorld.net is the USA based hosting company founded in 2001. It is one of few companies offering not only Linux hosting but Windows as well. Their shared servers are located in the USA (in Chicago and Phoenix), dedicated servers in the USA and Amsterdam, the Netherlands. It seems a bit strange, though, that there is no physical address. Nevertheless, numerous guarantees are given at a special page on the web site. Currently, 3 shared plans are offered. They can be purchased for 6, 12 and also for 36 months. The table above demonstrates 36-month monthly prices, they are the cheapest and the most beneficial options to choose. Various methods of payment are specified. The company provides a 30-day Money Back Guarantee. At each page of the website, customers may find the telephone and 24/7 live chat for technical support and other inquiries that is very convenient both for experienced users and for new customers. 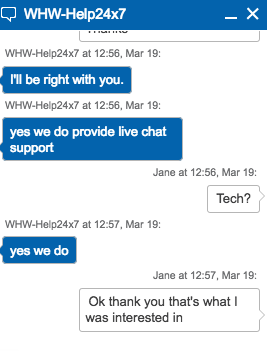 We have checked their live chat and it works fine and fast. Also, there are a phone number, that replies “instantly”, Skype for “priority support only” and a ticket system with “First Reply: 30 Minutes” guarantee. The company gives “99.9% uptime guarantee” on its pages. However, it gained only 4.4 HRank from us and became #132 in 2018. Its uptime chart reveals a very unstable picture where cases of 97% and 98% uptime were a regular occurrence. Not exactly what they guarantee. Response time chart also reveals unstable response from the domains on Shared IPs. Average range stayed between 600ms and 900ms. The number of Shred IPs stayed the same (4) but one can notice a gradual decrease in the number of websites for WebHostingWorld.net in 2018.